One of the most common causes of upper respiratory infection in cats is the feline herpes virus. This virus is also known as rhinopneumonitis (FVR), the rhinotracheitis virus, and the feline herpesvirus type 1 (FHV-1). They all sound like worrisome illnesses but, fortunately, this virus as well as its variations are quite common and can be treated and managed successfully by your veterinarian. FVR is very contagious and many cats are exposed to it at some point in their lives. A cat may develop a mild case that clears up without formal treatment. However, the majority of cats who have the virus never get rid of it altogether and the risks are that it will reoccur, become chronic, and, if not treated, encourages secondary effects and bacterial or other infections. A cat with this virus in their system may be a lifelong carrier. An FVR or FHV-1 infection has flu-like symptoms and is frequently referred to as “feline influenza.” As you might expect from this name, the first obvious symptoms are upper respiratory problems such as sneezing, a runny nose, redness, inflammation, swelling of the inner lining of the eyelids, eyelid spasms, and squinting. The next symptoms that may occur later are a fever, cough, lethargy, and anorexia, which may develop as kitty loses their appetite. After the initial symptoms disappear, a secondary bacterial or some other type of infection may develop, usually in the eyes, nose, or mouth. Both wild and domestic cats of all ages, sizes, and breeds are prone to the feline herpes virus. It is usually spread through direct contact with the secretions of an infected cat. The virus is also airborne; a cat can catch it when an infected cat sneezes near them. Humans can’t catch herpes from a cat and neither can a dog, and it is a different herpes virus from the one transmitted to humans. Any discharge from a cat carrying this virus will infect other cats. It is spread by sharing food and water dishes, sharing litter boxes, and when cats groom each other. Sadly, an infected cat can become a latent carrier and spread the virus without showing any symptoms. 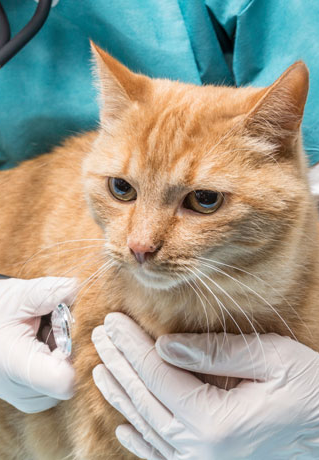 If symptoms do reappear, it usually means the infected cat has been subjected to emotional, medical, or environmental conditions that have weakened or stressed them out, such as an illness or a physiological stress. Any cat can be at risk, but Persians and other flat-faced cats are more prone to feline herpes. Cats with weakened immune systems and kittens and senior cats are also at risk. If your cat has ever been diagnosed with FVR or FHV-1, be on the lookout for a recurrence. If you note the symptoms of an upper respiratory infection or any flu-like symptoms in your cat, take him or her to a veterinarian for a diagnosis and treatment if any is required. Even if no treatment is needed because the disease is very mild, their condition requires ongoing supervision. Have your cat vaccinated against rhinotracheitis as a kitten, and be sure to take him or her to your veterinarian for booster shots as advised by your vet. Although the vaccine won’t completely protect your cat from the virus, it will lessen the severity of an upper respiratory disease. It will also prevent or reduce the possibility of secondary infections. If your cat receives all of their core vaccinations and boosters, they will strengthen their immune system so that he or she will be less likely to be affected by bacterial and viral threats. Isolate any of your cats showing symptoms of the virus from the other cats in your household (if there are any). This may be helpful temporarily when the symptomatic cat is showing signs of being affected by the virus, but it is important to consider that there may already have been or will be exposure from one cat to the other if they live together. Keep your cat carrier clean. Disinfect it if it is used by another cat. Keep your cat strictly indoors. Do not let your cat mingle with unknown, unvaccinated cats if he or she is going to meet a friend’s cat, for example. Even though it is unlikely that an infected cat will ever be completely rid of the feline herpes virus, there are a number of treatments for the symptoms that accompany it and treatments for any secondary infections that may follow. A veterinarian can determine what, if any, treatments are required. If your cat is sneezing but doesn’t have a fever, a cough, an eye infection, dehydration, or a loss of appetite, your veterinarian may decide that no medication is required, but will want to see them again if other symptoms occur. For a serious respiratory infection, an eye infection, relief of pain, or to prevent a secondary infection from occurring, your veterinarian may prescribe medicine. If kitty is refusing food and liquid, your veterinarian will recommend one or more treatments to make sure he or she gets the food and liquids they need to recover. Clean their eyes and nose with a warm, damp cloth so that hard, uncomfortable crusts don’t form from discharges from the eyes and nose. Put a humidifier or vaporizer in the room they use the most to relieve their nasal congestion. Offer them their favourite nutritious food and treats to keep him or her interested in eating, and lots of water to keep them hydrated. Make sure their water and food bowls are kept clean and the litter box is changed frequently. Encourage rest by keeping them calm and comfortable. Make sure your family leaves them alone until kitty is feeling better. To help keep your kitty free from adverse effects of feline herpes virus, make sure he or she has all the vaccinations they need and see that they have an annual checkup and boosters; this combination will keep their immune system strong. If you recognize the telltale feline herpes virus symptoms, take kitty to a veterinarian right away for an examination. As long as you carefully follow the advice you are given, your kitty will soon be back to normal and any residual problem can be managed.